China have re-established themselves as the Badminton Asia Junior kingpins with an impressive 3-0 win over Japan in the final in the Pembangunan Jaya Raya Badminton Asia Junior Championships Mixed Team Event in Bintaro, Jakarta on Tuesday. This is China's eighth title since the junior team championships became a mixed team event in 2006. Previously it was a team event for men and women. China's previous wins were in 2008, 2010, 2011, 2013, 2014, 2015 and 2016. Last year China lost to Japan in the quarter-finals. Japan won the title in 2012. "We came well prepared this year and we were confident of winning the title this after losing in the quarter-finals last year," said a delighted China head coach and manager Wang Wei, adding that it was a sort of sweet revenge over the Japanese in last year's quarter-finals. China's mixed doubles Guo Xinwa-Liu Xuanxuan started the ball rolling for the champions by winning the first point with a 21-19, 21-14 win in 38 minutes over Hiroki Midorikawa-Natsu Saito. 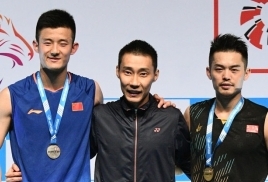 Li Shifeng put his team in the driving seat when he defeated Taiki Kato in the men's singles in a 40-minute encounter. 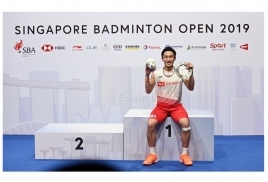 China was given some resistance in the men's doubles before reigning men's doubles champions Di Zijan-Wang Chang clinched a 20-22, 21-9, 21-12 over Hiroki Midorikawa-Hiroki Nakayama in 50 minutes for the winning point. Japan's head coach Hasegawa Hiroyuki sportingly admitted that China "was too strong" in the championships.